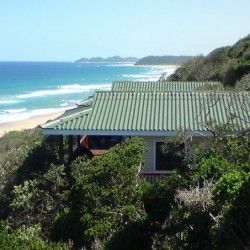 Kangela Estate 13 is a marvellous self-catering house in Ponta Malongane which can accommodate 10 guests. 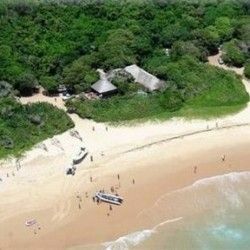 Kangela Estate is an upmarket gated estate in Southern Mozambique, surrounded by a forest of indigenous shrubs and situated on a pristine private beach. Kangela Estate 13 has 5 bedrooms, all with en-suite bathrooms and cooled by ceiling fans. Two of the bedrooms have two twin beds, two have king size beds and the 5th bedroom has four single beds. The bedrooms are located upstairs and all open onto the communal balcony with views over the blue ocean. The spacious living areas are located downstairs. The open plan lounge features a flat screen TV with DSTV and music system. The large deck leading from the lounge has a private swimming pool, a games room with pool table and a private walkway to the beach. The kitchen is fully equipped for self-catering including a gas stove, double eye level oven and a separate scullery. The games room with pool table is situated in a separate building at the pool deck. In addition, a private sitting area on the walkway to the beach is the perfect spot to enjoy refreshing sundowners and watch the antics of the whales during the winter months. Additional R500 will be charged for extra beds/guests.